Winston-Salem is the hardest city in the United States in which to escape child poverty, with the exception of a few Indian Reservations.¹ Nearly everyone is shocked when they first learn this startling fact, and some don’t believe it. “What about Chicago, or the Bronx, or Appalachia?” they ask. “Winston-Salem cannot possibly be a more damaging environment than Oakland or South L.A. or Harlem!” Yet it is. This week we want to share 1) what this statistic does and does not mean and 2) the history and factors that make Winston-Salem one of the most detrimental environments for low income children in America. When people say that Winston-Salem is the hardest city in which to escape child poverty in the United States, they are referring to a 2015 Harvard study conducted by a scholar named Dr. Raj Chetty. Dr. Chetty specializes in identifying economic trends in the United States, determining their causes, and communicating this information to policy makers and the general public. Dr. Chetty’s research has pointed to a phenomenon he calls “the fading American dream,” in which people’s economic fortunes vary tremendously based upon where in the United States they are raised. While growing up in certain communities provides children with a long term economic boost, other neighborhoods can leave them at a lasting financial disadvantage. According to the data, children born to impoverished parents in Forsyth County, North Carolina (whose income falls within the 25th percentile of the national mean)—in the Winston-Salem commuting zone—lose 1.1% average adult income for every year they remain in Forsyth. No other county in the United States had this negative of an impact on impoverished children (outside of a few Indian reservations). This means that children born in poverty in Forsyth have the lowest rates of upward mobility of any non-Indian reservation county in the United States (Out of the 2,875 assessed). This does not mean that Winston-Salem has the highest rates of poverty in the United States, or that it is the worst place in the country for the poor to live. What it does mean, however, is that (taking into account the noted exceptions) children born and raised in poverty in Forsyth County, North Carolina have the highest chances of remaining in poverty all of their lives as compared to any other county in America. RJ Reynolds became king of tobacco in 1958; the same decade that it became clear smoking causes lung cancer. If the adage “uneasy lies the head that wears the crown” could ever be applied, it rang true for tobacco’s new industry leader. Starting in the 1950’s, Reynolds found itself inundated with wrongful death lawsuits which continued for decades. This legal trouble, combined with new market pressure from Philip Morris and the Marlboro brand, began years of decline for Reynolds. In an effort to raise profit margins with more efficient production, Reynolds planned to open a series of massive, modern factories in and around Winston-Salem. When the first of these factories was complete in 1986, plans for all of the other factories had to be placed on hold due to Reynolds continued financial decline. With the opening of the new plant, Reynolds’ remaining employees faced yet another hurdle; working with technology. Reynolds had to pay many of its employees to go to Forsyth Technical Community College so that they could learn how to do their jobs alongside computers. As the push toward modern production continued, the leadership of Reynolds realized that many of its long-time employees did not even know how to read and write. Times were changing, and Winston-Salem was struggling to keep up. These changes coincided with the bankruptcy of Mclean Trucking. When McLean declared bankruptcy, it was the 5th largest trucking company in the country, and boasted 10,000 employees, 1000 of whom worked at its headquarters on Waughtown Street in Winston-Salem. 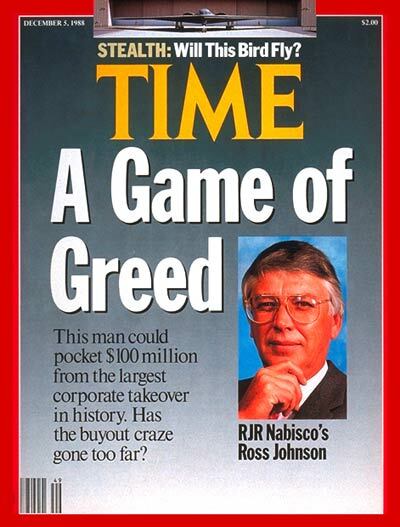 The next year, the leadership of RJ Reynolds Tobacco Company, now “RJR Nabisco,” was ceded to an outsider in the largest corporate takeover in American History. The new boss, F. Ross Johnson, moved Reynolds’ headquarters from Winston-Salem to Atlanta. In 1987, RJR Nabisco lost 2000 more jobs as a part of a leveraged buyout, and would go on to shed another 5000 jobs over the next 3 years. This constituted a tremendous moral blow to Winston-Salem, a city now facing both economic and identity crises. JOHNSON’S ACTIONS LANDED HIM ON THE COVER OF TIME MAGAZINE, BRINGING NATIONAL ATTENTION TO WINSTON-SALEM’S GROWING CALAMITY. We are planning to write a future article about how each of these factors manifest themselves in this city, but for now suffice to say that Winston-Salem underperforms in each category. As you have read, it took years for Winston-Salem to find itself at the bottom of the social mobility spectrum, and it will take years for it to climb out. As we shared in last week’s article, the Piedmont Renewal Network exists to stand in the gap, and create equality of opportunity in the American city that needs it the most. It is a fantasy to think that we can fight poverty in Winston-Salem by resuscitating the low skill labor market. Technological progress is both inevitable and good, and we can no more restore last century’s economy than we can bring back yesterday’s sunset. There is, however, a way for Winston-Salem’s emerging industries to bring prosperity to the communities that need it most. We may not be able to lower the level of education required to participate in the high skill workforce, but we can lift the young people of our city to that required level of education. Through education, we can seize the moment and equip Winston-Salem’s new economy with qualified workers from the city’s disenfranchised neighborhoods. We must make a concerted effort to prepare the marginalized youth of our city for the higher education that they desperately need to compete. We must be relentless in our efforts to equip the least fortunate students of today to fill the most rewarding jobs of tomorrow. This is possible, and it is the work of the Piedmont Renewal Network. ³ “CPI Inflation Calculator,” Bureau of Labor and Statistics, accessed February 6th, 2019, https://www.bls.gov/data/inflation_calculator.htm. ⁶ Chetty, R., Hendren, N., Kline, P., Saez, E. (2014). Where is the Land of Opportunity? The Geography of Intergenerational Mobility in the United States. Equality of Opportunity Project.